Madurai Shanmugavadivu Subbulakshmi known as MS Subbulakshmi or more popularly as ‘MS’was a sublime singer who ruled the Indian classical music world for over five decades.Blessed with a divine voice,immeasurable talent and ethereal beauty she captivated the hearts and minds of innumerable fans. MS was acknowledged at the time of Indian Independence as the “Nightingale of India”. Former Indian premier Jawaharlal Nehru once paid her a huge compliment saying ‘Who am I a mere Prime minister before a Queen, the Queen of Music’? MS Subbulakshmi was born on September 16th 1916 in the southern city of Madurai in Tamil Nadu. The current 2016 is her birth centenary year. Subbulakshmi whose pet name in childhood was Kunjamma trained in Carnatic music under Semmangudi Srinivasa Iyer and learnt Hindustani music from Pandit Narayanarao Vyas. Subbulakshmi’s mother Shanmugavadivu Ammaal was a Veena exponent hailing from the “Isaivaelalar” community. Her father Subramania Iyer was a Brahmin lawyer. She married Thiyagaraja Sathasivam known as “Kalki”Sathasivam who co – founded the popular Tamil weekly magazine “Kalki” and remained at its administrative helm for many decades. Among the many honours that came to MS for her singing is the Ramon Magsaysay award described by some as the Asian Nobel Prize. 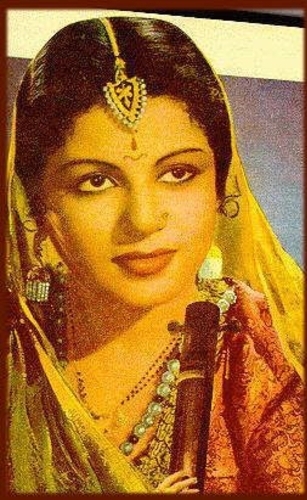 She was the first Indian musician to receive that award. The citation read as follows “Exacting purists acknowledge Srimati M. S. Subbulakshmi as the leading exponent of classical and semi-classical songs in the carnatic tradition of South India”.MS Subbulakshmi was also the first Indian vocalist to be awarded the “Bharat Ratna” – India’s highest civilian honour.MS passed away peacefully in Chennai at the age of 88 on December 11th 2004. 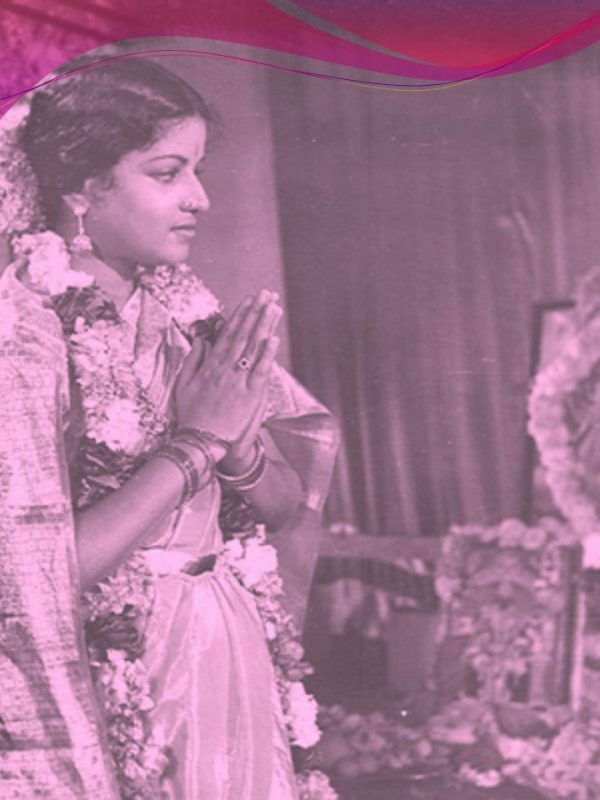 During her illustrious career MS Subbulakshmi acted in four Tamil movies and one Hindi film. The Tamil films were “Sevasadanam” (1938), “Sakuntalai”(1940), “ Saavithri”(1941) and “Meera” (1945).The Hindi movie was “Meerabhai”(1947).The most famous and successful one of the four Tamil films was ‘Meera’ which was re-made in Hindi as “Meerabhai”. 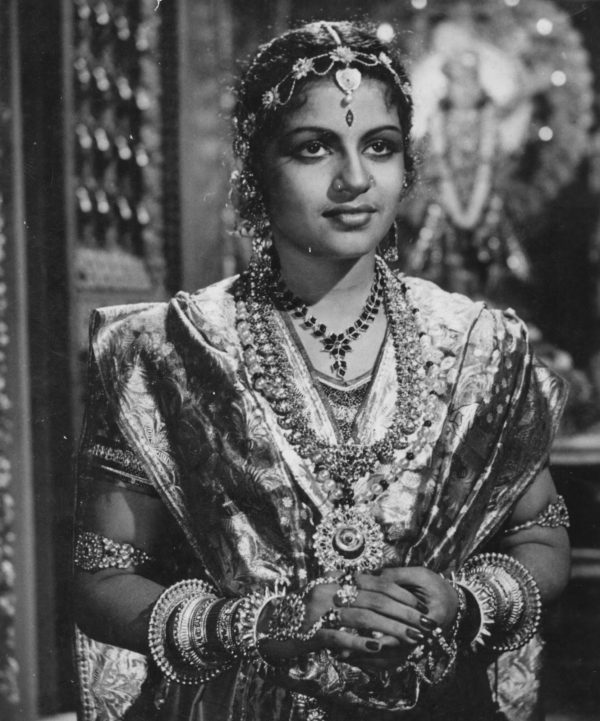 MS Subbulakshmi played the title role “Meera”. The film was about the Rajput princess Meerabai who was an ardent devotee of Lord Krishna and sang many devotional bhajans in praise of him. Meera produced in 1945 was directed by the American maestro Ellis.R.Dungan and is regarded as one of the 100 best Indian films produced in the last century. What endeared “Meera” most to most film goers was the musical score. 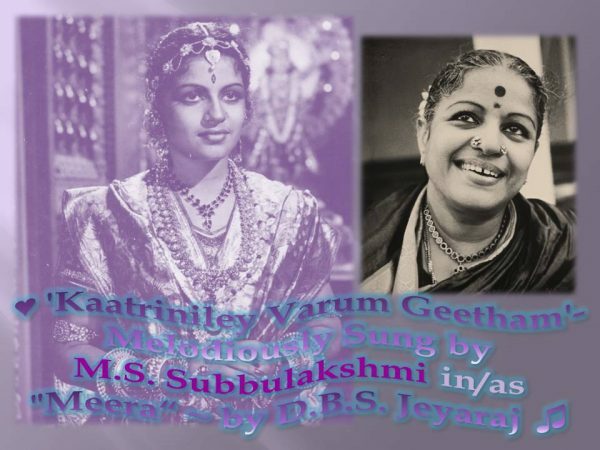 There were 21 songs in all with most of them being sung by MS.Almost every song in Meera was a hit but the most famous of them all was ‘Kaatriniley Varum Geetham’.It is a solo that was picturised on MS Subbulakshmi herself whose appearance,diction, poise and rendition makes the song an immortal number.There is no doubt that this song is one of the highlights of the movie. The veteran film producer – director “Muktha” V. Srinivasan has written in his memoirs about growing up in Kumbakoanam that his neighbour – a Brahmin housewife- went every day to the theatre to see “Meera” during its multi – week run in town only to hear the songs particularly “Kaatriniley varum geetham”. ‘Kaatriniley Varum Geetham’ is a perennial classic in the sphere of Tamil film songs. It is based on the Sindhubhairavi raga. This song was a favourite of one of my aunts who would be singing snatches from it frequently. As a kid I used to tease her by bursting into this song as soon as I saw her but with the passage of time the song cast a magical spell on me too.I have been fortunate in seeing the film on the big screen twice and several times on the small screen through DVD.Gradually I became more aware of its finer points and learnt to appreciate the songs more. The music score for the film “Meera” was composed by the legendary S.V. Venkatraman called SVV.The music for some songs were his original compositions while tunes popular in North India were used for others. 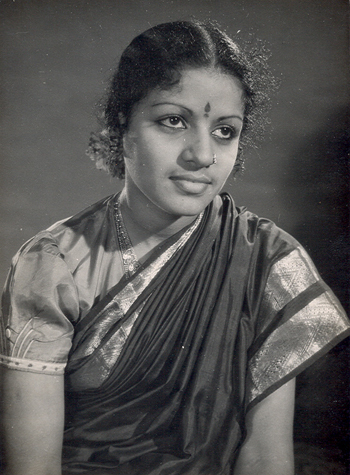 According to ‘Vaamanan’ the reputed chronicler of Tamil film music, the original inspiration for Katriniley varum geetham was from the song ‘Loot Gaye’sung by Juthika Roy the well known Bengali singer of Meera bhajans and other classical songs. Apparently MS Subbulakshmi and her enterprising husband T.Sathasivam were planning to bring out some Meera bhajan gramophone records and had already recorded some songs in this regard. Well known Editor of the Tamil ‘Kalki’magazine ,‘Kalki’R. Krishnamurthy had been enamoured of the melody of the song sung by Juthika Roy and used to hum it often. Since Krishnamurthy was associated with Sathasivam in the ‘Kalki’venture and was a close family friend ,MS wanted him to write words in Tamil to suit the melody of Juthika Roy’s Bengali song . Kalki Krishnamurthy did so and the song Kaatriniley Varum Geetham was born. The song was sung by MS and duly recorded but the gramaphone disc was not released for a while. Subsequently a decision was reached by Sathasivam and Subbulakshmi to produce Meera as a film and to use the “Kaatriniley” song for it. When SVV took over music composition he was given the recording of Katriniley as sung exactly by MS to the tune of the number by Juthika Roy.Venktraman however refined the melody utilising Carnatic musical connotations from the Sindhubhairavi raga. Cinema chronicler and writer Randor Guy writing about the movie “Meera” in his series “Blast from the Past” in “The Hindu” observes – “. S. V. Venkataraman, a highly talented composer, was largely responsible for the soul-filling music in the film. Almost every song in Meera, is a gem, and “Kaatriniley Varum Geetham…”, penned by ‘Kalki’ and rendered by MS, stood out for its melody and the lilt in the singer’s voice”. The classical music exponent and columnist Charulatha Mani describes Sindhubhairavi as “one of the most interesting and colourful of ragas” and also calls it “One of the most well-utilised ragas in film music “.Charulatha Mani in her popular series titled “A raga’s journey” published in “The Hindu” writes of Sindhubhairavi thus –“This raga is suited for lighter pieces, exudes bhakti and sringara rasas, and could melt mountains”. She goes on to say that “ Kaatriniley varum Geetham” is one of the exemplary depictions of Sindhubhairavi raga in film music. “M.S. 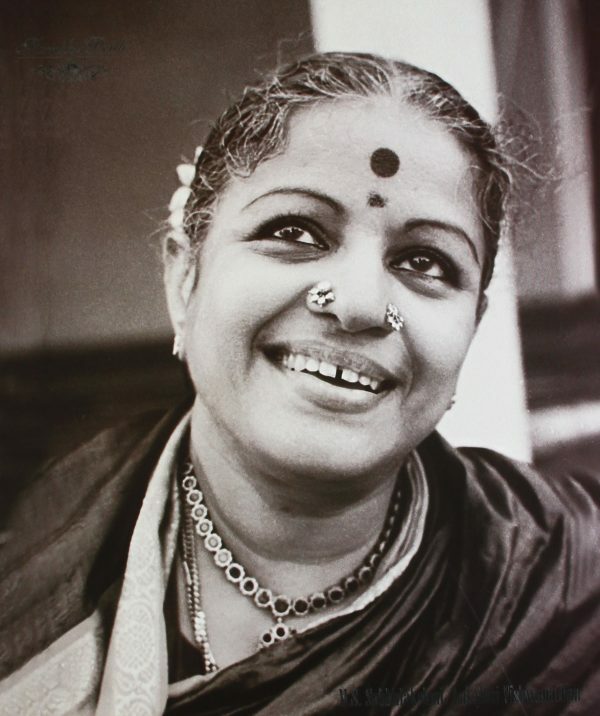 Subbulakshmi’s renditions of ‘Anandam En Solvene’ from Sakuntalai, ‘Brindavanathil Kannan Valarndha’ and ‘Kaatrinile’ from Meera, are exemplary depictions of this raga”. The song “Kaatriniley varum Geetham” picturised on MS as Meera was shot on location in what is known today as the state of Rajasthan. A royal mansion on the outskirts of Jaipur and a garden with ponds and fountains near a palace in Udaipur served as settings for shooting scenes for the song. Jiten Bannerjee was the cinematographer. One may observe when viewing the you tube of this song that MS Subbulakshmi is clearly seen singing out the words in some shots while in others she walks without any lip movement. The song is heard in the background. This is because originally the entire song was shot in Jaipur but later scenes of Meerabai walking along the gardens of Udaipur were shot and included. Hence this variance. An impressive feature of this black and white film Meera released in 1945 are the captivating close up shots of MS Subbulakshmi in this song and in many other scenes. The camera angles and lighting help bring out perfectly the beauty, moods and expressions of the heroine’s remarkable facial features. For this Ellis Dungan and Bannerjee made a replica bust of Subbulakshmi’s face and experimented with it shooting from many angles and lighting shades. This helped to shoot MS perfectly in the actual film scenes. MS Subbulakshmi’s face is elegantly portrayed in the close up shots as she sings with emotion and passion. Her striking eyes sparkle with expression. She gently moves her face from side to side as she sings out from her heart. Even as she sways the viewer also sways in harmony enraptured by the singing. Randor Guy writes thus – “ Dungan and his chief cinematographer Jiten Bannerjee gave their best to make Meera a black-and-white marvel. Especially the close-ups of MS who appears divinely beautiful. Dungan made a mould of her face, and along with Bannerjee took several shots in varying angles, lighting patterns and frame sizes. Later, the two would project those test bits of film on a screen over and over again, and study each shot. That’s how the best way to project MS on the film was decided and executed. No wonder, she looks enchanting in this vintage movie”. Another interesting aspect of the picturisation of the song is that the sequences are shot in daylight. However some lines in the verses refer specifically to the night.One is ‘Vaana veliyinil Thaaraa kanangal’(Hordes of stars in the spatial skies) and the other ‘Nilaa malarntha Iravinil Thendral Ulaavvidum Nadhiyil’(The breeze moving over the river during the night when the moon blossoms).The former line is shown simply in daylight but the latter one is illustrated by an inserted image of a moon lit sky. The lyricist Kalki Krishnamurthy was a well known Editor and creative writer famous for his articles, short stories,reviews and novels. Though he wrote verse occasionally it was not regarded as his forte by readers. The Kaatriniley varum geetham lyric however was a noteworthy effort that marked Kalki’s prowess in this sphere too. The song is no doubt a paean to Lord Krishna but it is an ode to music also. The power of the geetham or song is described in many ways by the lyricist such as ‘ripens stone into fruit’(kallum kaniyum)’makes dead trees sprout(patta marangal thulir vidum) ‘entrancing listening Jungle animals’(Kaattu Vilangugal Kaette mayangum) etc. As stated earlier this is a song that continues to be a source of aesthetic pleasure in many modes to me. I do hope that those of you who can appreciate songs of this type will enjoy this pleasure along with me.And now let me take leave and let the winds carry the song ‘Kaatriniley Varum Geetham’ to you and hope that it would make you as happy as it makes me. « Joint Opposition Would Approach Supreme Court in early September to Clarify Whether 19th Constitutional Amendment Has Debarred Chandrika Kumaratunga and Mahinda Rajapaksa From Contesting Presidential Elections or not .